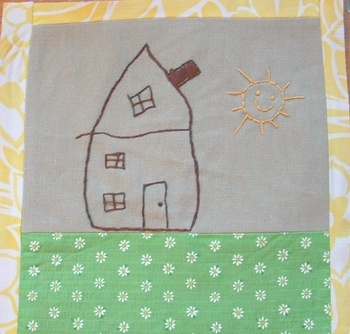 Here's my contribution for the Quilts for Katrina project started by Shanna. The blocks will be put together and auctioned off for the Red Cross, with some being donated as well. I think she's accepting signups until the end of day today (Monday)--there's been an amazing response, and some wonderful contributions already posted on the Flickr group. There's something that feels good about using my hands to DO something about the nightmare going on for so many people, so I'm grateful for the chance to do this. The embroidery is of course, from one of Calvin's drawings. He drew this, among lots of other houses, last week after learning about the hurricane. There's a really fine line at this age (or any age, for that matter) of deciding how much to expose him to of the world and it's sadness, while still wanting to protect that amazing, innocent 'cloud' that they have hovering over them the first few years of life. So while his knowledge of this incident is limited, his heart about it is enormous..like most other children right now, I'd imagine.